While vitamins and supplements after Weight Loss Surgery are taken for life, they are not intended to replace whole foods. Experts from the Mayo Clinic state that, “supplements can’t replicate all of the nutrients and benefits of whole foods.” Weight Loss Surgery patients must strive to develop a balanced diet incorporating whole foods with the essential nutrients, and continue to be diligent with their vitamins and supplements for life. Red spices: 3691 IU in 1 Tbsp paprika which is 1055% of the daily value. Cayenne and chili powder offer similar doses. Consider spicing up meals with these Vitamin A spices! Orange vegetables: Carrots, sweet potatoes, pumpkin, butternut squash: ½ a medium sweet potato provides 215% of the daily value or 1100 IU, a single baby carrot provides 41% of the daily value or 1033 IU. Dark leafy greens: Kale, turnip, mustard and collard greens offer between 133-308% of the daily value. Bariatric Advantage offers a dry Vitamin A capsule with 10,000 IU. Bariatric Advantage offers a Vitamin B1 capsule, 100 mg. Celebrate Vitamins offers a B50 Complex which includes 50 mg, B1. Clams, oysters & mussels: 3 ounces of clams has 84 micrograms, and the same amount of oysters has 29 micrograms, providing 400% of the daily value. These seafoods are also a good source of zinc, copper and iron. Liver is again a super-food offering more B12 than any other animal product, 1000% of the daily value in lamb liver. Crab, lobster, octopus, mackerel, salmon & tuna provide between 110-510% of the daily value. Swiss cheese has 56% of the daily value in 3.5 ounces, and one egg yolk provides 6% of the daily value. Bariatric Advantage has sublingual Vitamin B12 with 1000 micrograms. Celebrate Vitamins also offers sublingual B12, quick-melt, 1000 mcg. Building Blocks has B12 1200 micrograms in a sublingual mist. Twin Lab Bariatric Support has 500 mcg quick-dissolve tablets. Studies show that nearly 60% of patients prior to weight loss surgery, are Vitamin D deficient. 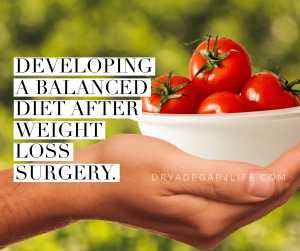 Approximately 50% of Gastric Bypass patients, are still Vitamin D deficient after surgery. Seafood: Cod liver oil, herring, catfish, oysters, salmon, trout, halibut: 2217-645 IU in a 1 ounce serving. Fortified tofu provides 176 IU per 1/2 cup, and fortified soy milk has 59 IU per 1/2 cup. Milk products are already high in calcium, and fortified with Vitamin D provide 63 IU per four ounce serving. Add mushrooms to an egg & cheese omelette and (1 egg, 2 ounces of mushrooms, 1 ounce of cheese) 55 IU of Vitamin D! Cheese: Parmesan, Romano, Gruyere, Mozarella, Swiss, Cheddar, Provolone are the highest, providing 386-212 mg per ounce. Almonds & Brazil nuts have 183-106 mg per 4 ounce serving. Yogurt & milk are great calcium sources, and simple to get in your daily diet with 215 mg per 4 ounces of low-fat yogurt and 153 mg per 1/2 cup of non-fat milk. Add dried herbs to your favorite entrees and you pack in 85-21 mg per tablespoon: dried savory, celery seed, dried thyme & dill, marjoram, rosemary, sage, and oregano. Bariatric Advantage has 500 mg Calcium Chewables with 300 IU of Vitamin D3. They also have Chewy Bites with 500 mg of calcium citrate and 500 IU of Vitamin D.
Bariatric Advantage has Liquid Vitamin D (10,000 IU), Dry Vitamin D (5,000 IU), and Chewable Vitamin D Gels (10,000 IU). Celebrate Vitamins has Chewable Calcium with 1000 mg of calcium citrate and 1000 IU of Vitamin D. They also have Calcet Creamy Bites with 500 mg calcium citrate & 400 IU of Vitamin D.
Building Blocks Vitamins has Calcium capsules with 1000 mg of calcium and 600 IU of Vitamin D.
Bariatric Fusion offers Dry Vitamin D with 5000 IU in a quick dissolving capsule. Post-operative iron deficiency ranges from 20-49% after bariatric surgery. Some food components decrease Iron absorption like those found in coffee, tea and cocoa. For best Iron absorption eat with Vitamin C! Bell peppers, chili peppers, berries, broccoli, cauliflower, leafy greens, citrus fruits, guava, melons, onions, pineapple, kiwi & strawberries range in 182 mg – 45 mg per 4 ounce serving. Bariatric Fusion has chewable Iron with Vitamin C.
Bariatric Advantage has chewable Iron in 18, 29 and 60 mg. They also offer raspberry chews with 30 mg Iron and 60 mg Vitamin C.
Celebrate Vitamins has a 30 mg Iron tablet with 60 mg of Vitamin C. They also have 18 & 30 mg Chewables in tangerine and grape. Again seafood is at the top of the list! Halibut, salmon, sardines, tuna, cod, crab, and scallops range from 219 mg per 3 ounce serving (Halibut) to .34 mg of Omega-3 Fatty Acids. Omega-3 fortified milk has 32 mg per 8 ounce serving, and an Omega-3 eggs provide 75 mg.
Bariatric Advantage offers a 750 mg softgel and 160 mg cherry chew. Celebrate Vitamins has orange and lemon-lime flavored gel-paste packets with 650 mg.
Barleans has Omega-3 liquid in bottles and mini to-go pouches with 720-1500 mg per serving, in lime, orange, mango-peach, lemon, and pina colada.